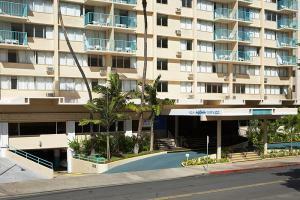 Designer boutique hotel located two blocks from the beach and steps from dining and shopping. This hotel, where surf style meets urban sophistication, offers the following free amenities: daily continental breakfast, high speed Internet and Wi-Fi local and toll-free calls, mini-refrigerator and microwave. The hip lobby connects to spa fitness area, restaurant and pool area. FREE continental breakfast served daily, Restaurant on-site. Eco Tours, Sailing, Scuba Diving, Parasailing, U.S.S Arizona Memorial & Pearl Harbor, Historical Iolani Palace, Chinatown, Waikiki Aquarium, Ala Moana Shopping Center, Kodak Hula Show, Polynesian Cultural Center, just four blocks from world famous Waikiki Beach.